Theresa May is holding talks to finalise a deal with the Democratic Unionists to support a minority Conservative government. DUP leader Arlene Foster said she hoped an agreement would be reached today. Issues like Brexit, the economy, taxation and counter-terrorism measures have been discussed by the two parties. Labour warned a deal could destabilise the Northern Ireland peace process and said it was ready to form an alternative minority government. The Conservatives are having to rely on the support of 10 DUP MPs after they fell eight seats short of winning an overall majority at the general election. It means that Theresa May will remain as prime minister and the DUP MPs will be central to the survival of a Conservative Party administration. The party will offer support for key votes like backing the Queen’s Speech, the Budget and any votes of no confidence. The DUP campaigned for Brexit but is also conscious that 56% of people in Northern Ireland voted to remain in the EU. They are thought to be advocating a softer Brexit that does not disrupt the “frictionless border” with the Republic of Ireland. They are also opposed to Conservative polices such as means-testing the winter fuel allowance and have campaigned for a higher living wage and an end to the so-called bedroom tax. The party is also likely to push for more investment in Northern Ireland, with emphasis on increased borrowing powers and looser budget controls rather than direct cash. Prime Minister Theresa May said on Tuesday that talks with the DUP had been productive and that Brexit negotiations would begin as planned next week. “I think there is a unity of purpose among people in the United Kingdom,” Mrs May said following a meeting with French President Emmanuel Macron in Paris . 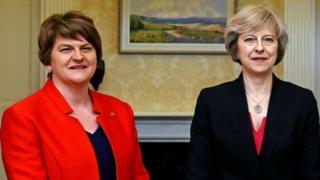 The agreement with the DUP is expected to be very different to the coalition deal agreed between the Conservatives and Lib Dems in 2010, with DUP politicians not getting cabinet jobs and their support for the majority of new legislation to be determined on a vote-by-vote basis. Labour’s shadow business secretary Rebecca Long-Bailey called it a “very dangerous deal” and said Labour was “ready and waiting to form a minority government”. She dismissed accusations of hypocrisy after it emerged that Gordon Brown had tried to do a deal with the DUP in 2010, telling BBC Radio 4’s Today programme: “It’s certainly not something that Jeremy would advocate and the Labour Party is certainly not advocating that. “As I’ve said, it would create a lot of instability in terms of the peace process in Northern Ireland and it’s a very worrying time. 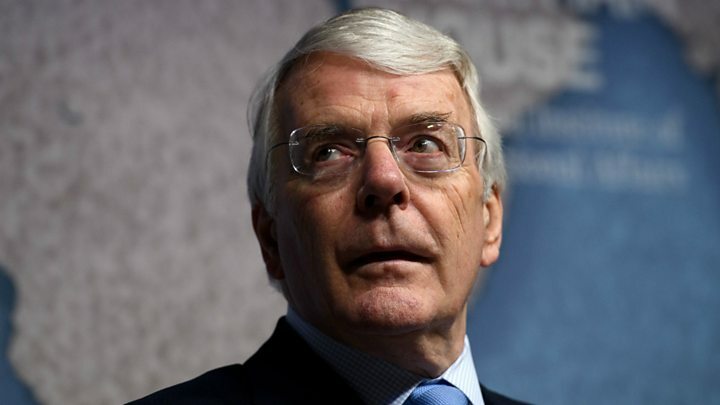 On Tuesday, ex-Conservative PM Sir John Major said he was “dubious” about the idea and its impact on the peace process. Sir John told BBC Radio 4’s World at One there was a danger the government would no longer be seen as an “impartial honest broker” in restoring the power-sharing arrangements and upholding Northern Ireland institutions. Asked about Sir John’s comments, Mrs May said she was “absolutely steadfast” in her support for the 1998 Good Friday Agreement – which created the Northern Ireland Assembly – and efforts to revive the power-sharing executive.